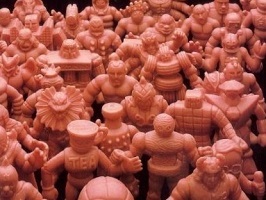 This week I’m going to discuss why I find M.U.S.C.L.E. figure #235 Buffaloman to be the most fascinating M.U.S.C.L.E. figure. I first saw this figure on Christmas morning 1987 when I opened my M.U.S.C.L.E. Wrestling Ring and immediately he became a favorite of mine. At that point I would have had a #2 Buffaloman figure and he was the one pictured on all the packaging. However, I thought that this Buffaloman looked bigger and tougher and so he instantly became leader of the bad guys. 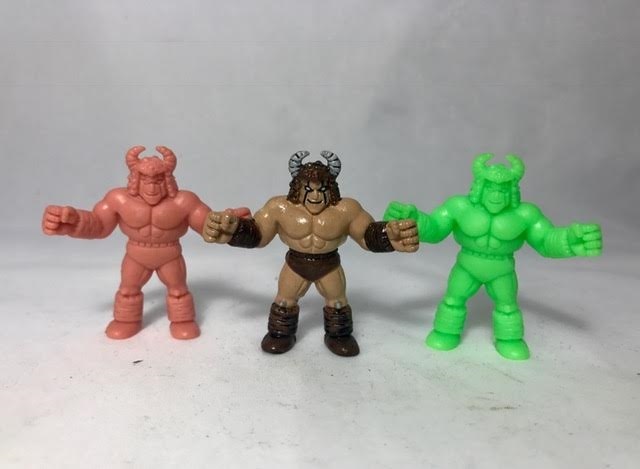 Fast forward to the beginning of my adult collecting and the first M.U.S.C.L.E. figures I bought were the 10 board game figures for $1 on eBay. I did not know of the board game, nor at the time did I know that the five Grape figures were the only grape ones. The bonus for me was receiving the Green #235, easily worth the $1 alone to me. My hope after all that time was the #235 figure DID come in a bunch of colors. Of course I was wrong again and so the two different color #235 figures hold a special place in my collection. I then had a custom painted one done so I could have three different ones. What makes #235 so special to me now is that he is the only M.U.S.C.L.E. figure that was purely sculpted for the line and by Mattel I assume. He is the only figure that isn’t part of the 418 figure Kinkeshi set in Japan (I don’t count #234, it’s basically #141 with tiny differences). What intrigues me is why Mattel chose to sculpt an entirely new figure. Where did they get the inspiration or who designed the sculpt? 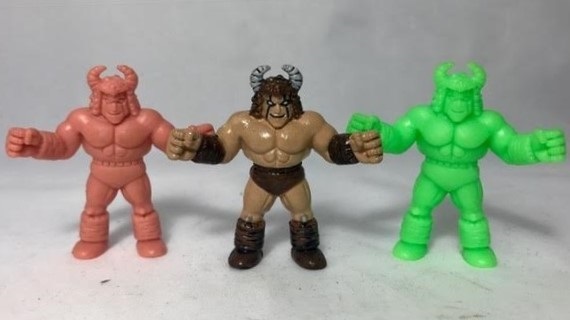 Why didn’t they just choose #93 Buffaloman (pictured on the box) or a different Buffaloman from the Japanese figures for the Wrestling Ring and board game? It then leads to the question of why just create one new sculpt? They could have done more of them or maybe that was planned before the line stopped selling as much. I have so many unanswered questions here but I’m really glad I have the two different colored #235 figures, he’s a special part of M.U.S.C.L.E. history. I wonder if the Japanese Kinkeshi collectors know of his existence? This entry was posted on Monday, July 10th, 2017 and is filed under UofM News. You can follow any responses to this entry through RSS 2.0. You can skip to the end and leave a response. Pinging is currently not allowed. Great story – loved this one!